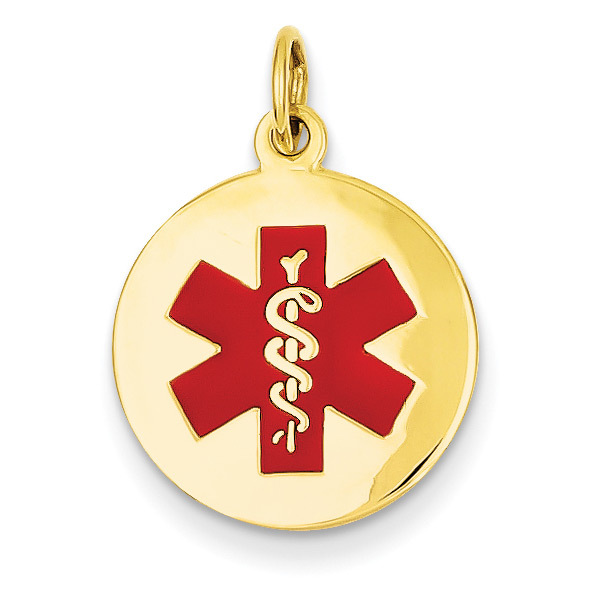 A 14k solid gold medical ID pendant necklace with a red enamel medical alert symbol on the front. The pendant may be engraved on the back with up to 3 lines and 8 characters per line (including spaces), such as name, phone #, and medical condition or any engraving of your choice. The medical i.d. pendant measures 5/8" in diameter and just over 7/8" with hoop/bale. If engraved, please allow an additional 2-3 business days before shipping. We guarantee our 14K Gold Medical ID Alert Necklace with Red Enamel (5/8") to be high quality, authentic jewelry, as described above.